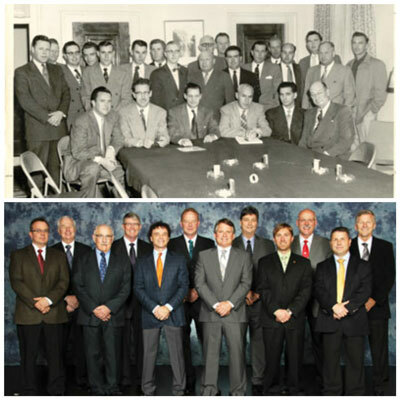 Then and now — Original Founding Meeting: Contractors at the first meeting of the PLCAC on April 20, 1954, at the MacDonald Hotel in Edmonton, Alberta. 2014-2015 Board of Directors: (Back) D. Kavanaugh, M. Prior, P. Schultz, N. Lane, D. Douglas, N. de Koning; (Front) B. Lailey L. Nash, K. Waschuk, D. Johnstone, N. Waugh, M. Scherer. Pipeliners have been working the Canadian provinces since the 1850s, but the industry’s contractors didn’t get its top advocacy group until a century later. This year marked the 60th anniversary — the so-called “diamond anniversary” — of the Pipe Line Contractors Association of Canada (PLCAC). Founded in April 1954, the PLCAC’s initial mandate was to represent contractors in labor relations and to establish pipeline construction skills training for workers. Now the association’s scope has broadened to include occupational health and safety matters, legislative review, industry advocacy and career awareness, pipeline standards and codes, as well as other industry concerns. Although the group was formed in 1954, it wasn’t officially incorporated until 1968. However, the pipeline and petroleum industry in Canada has a much deeper history. A hundred and one years before the PLCAC was founded, the country’s first pipeline was completed, according to the Canadian Energy Pipeline Association (CEPA). The 25-km cast-iron pipe transported natural gas to Trois Rivières, Quebec, and was among the longest pipelines in the world in 1853. Four years later, Canada’s first oil discovery would be made in Ontario when a carriage maker by the name of James Williams tried to dig a water well in 1857, but found black gold instead. According to PLCAC annals, the first commercial oil well in North America was drilled in Oil Springs, Ontario, a year later. News of Williams’ discovery spread fast, and prospectors from all over the country and the United States flocked to Oil Springs, sparking the first oil boom in Canada. afety Participants: Pictured here, at the 2014 60th PLCAC Annual Convention, are Regular Member representatives of companies that participated in the James L. Abraham PLCAC Safety Awards Program. The oil industry’s enduring standard of measure — the barrel, 42 gallons — is said to have originated with this burgeoning oil production in the Great Lakes region. The barrel was a suitable quantity for horse-drawn transportation at that time. By 1861, there were approximately 400 oil producing wells around Oil Springs, and the community saw an influx of wealth that led to the first paved street in Canada, according to PLCAC. The village’s main street was also lit at night by oil lamps. So much oil was being produced in the early 1860s that the 20 refineries built in the area could not handle the volume. An expansion of the Great Western Railway was built to transport the excess commodity, and crude oil was being shipped to other cities in Canada, the United States and as far away as Great Britain. The efficiency of transporting oil got a big boost in 1862 with one of the world’s first oil pipelines constructed from the famed Petrolia oilfield in Petrolia, Ontario, to Sarnia, Ontario, about 25 km away. By 1947, only three oil pipelines moved products to market in Canada. One transported oil from Turner Valley to Calgary, Alberta. A second pipeline moved imported crude from coastal Maine to Montreal, Quebec, while a third brought American mid-continent oil into Ontario. However, a significant discovery would be made in early 1947 that would change the industry forever. Imperial Oil Ltd. had been drilling for oil in western Canada without much luck. The company had exhausted nearly $23 million in exploration efforts and had drilled 133 consecutive dry holes up until 1947. On Feb. 3 of that year, at a site 15 km west of Edmonton and 80 km away from any of Imperial Oil’s previous drillings, a well by the name of Leduc No. 1 began gushing oil. The discovery would become known as the largest discovery in Canada in 33 years. For 60 years, pipeline construction contractors that are partnered with the pipeline craft unions in Canada have relied on the PLCAC to represent them in areas of labor relations and to work together with stakeholders involved in the pipeline construction industry. Pipeline construction in Canada has come a long way during the 60 years since PLCAC was founded. The association was founded on April 20, 1954, by a small group of contractors and suppliers at a meeting at the MacDonald Hotel in Edmonton. The PLCAC was created as a means to train Canadian personnel in the skills required to perform pipeline construction. The association continues today as a voice for contractor members on various items such as collective bargaining representation, safety education, joint labor-management trust fund administration, involvement with the Canadian Pipeline Advisory Council and the offering of programs such as the PLCAC Student Bursary Program. Officially, the association became incorporated on April 8, 1968, by letters patent as a corporation without share capital under the Canada Corporations Act and has been registered as agent for collective bargaining for its members under legislation in four provinces. As such, the PLCAC negotiates and renews 12 Canada-wide collective agreements covering mainline pipeline construction, distribution pipeline construction and pipeline maintenance and service. “As we celebrate 60 years, we wish to thank members for their support over the past six decades and thank those whose contributions to the association have made it a strong voice for pipeline construction contractors in Canada,” says PLCAC executive director Neil Lane. The association officially celebrated its 60th anniversary at the 2014 annual PLCAC Convention, May 11-15, in Vancouver, British Columbia. The convention was held at the Westin Bayshore Hotel Vancouver and hosted approximately 400 delegates and included industry speakers David Montemurro, representing TransCanada’s Energy East Pipeline, and Janet Holder, representing Enbridge’s Northern Gateway Pipeline, who provided up-to-date information on current and future pipeline projects across the country. Speakers also included special guest Chris Hadfield, Canadian astronaut, former commander of the International Space Station and the first Canadian to walk in space. Delegates included various contractors and suppliers from Canada, Europe and the United States. PLCAC‘s 2013-2014 president David Johnstone, of T.W. Johnstone Co. Ltd., kicked off the convention with an event the first night with a “Diamonds Are Forever” theme. The second night John Deere treated everyone to a “Splash Bash” event at the Vancouver Aquarium. On Wednesday evening, May 14, Caterpillar sponsored a “Best of the ‘60s” theme night. Safety awards were presented to contractor leaders as well as the annual Jack Cressey Future Leader Award, which was presented to Tom Patcka of O.J. Pipelines Canada. Attendees also had the opportunity for optional activities that included a tour of Granville Island, a Vancouver Harbor boat cruise, sea kayaking and a bike tour of iconic Stanley Park. The final evening of the convention featured a 60th Gala Celebration Reception and Banquet. Attendees were treated to entertainment by impressionist Martin Dube, who regaled the crowd with songs that had been performed by well-known personalities over many years. At the close of the evening, Johnston passed the president’s gavel to Mike Prior of Michels Canada, who is PLCAC’s 2014-2015 president. The 2015 convention will be April 13-17, on the Island of Maui, Hawaii, at the Hyatt Regency Resort. The PLCAC has expanded beyond its initial mission to represent pipeline contractors in labor negotiations to include other industry concerns, such as health and safety, regulatory and legislative review, and standards and codes. The group also serves as a forum for new ideas and networking among Canadian pipeline contractors. Over the course of the past year, the PLCAC has continued to foster the partnership between industry stakeholders, Lane says, including pipeline contractors, the pipeline trade unions and the pipeline owning companies. “Our engagement has ranged from the construction engineering aspect to being a project advocate during the regulatory and public hearing process making all parties more informed and knowledgeable,” he says. The current boom in pipeline activity in Canada has led to increased PLCAC membership, Lane adds. Over the course of the past 60 years of the PLCAC and since the first pipeline was laid in the country in 1853, Canada has become the world’s third largest supplier of crude oil and its fifth largest supplier of natural gas. As demand continues to grow in North America, Asia and other regions of the globe, the PLCAC and its members will continue to expand the Canada’s pipeline infrastructure to serve the needs of its customers at home and abroad. Bradley Kramer is a contributing editor for Trenchless Technology.